Now that good weather is here and the snow shovel has been safely stashed away, you may be thinking road trip. And if you’re like many of us, you probably have pets who like to go along for the ride. We got thinking about things that make for a good road trip with pets, from choice of vehicle, to the right accessories, to things to bring and trip planning. Here are some tips for safely and enjoyably taking the critters on the road. The first step is to choose the right car, SUV, or minivan. Start by narrowing your choices to one of our Recommended vehicles. That ensures you begin with something that’s reliable, scored well in our testing, and performed well in government or industry crash tests. A hatchback or small wagon is perfect for smaller pets. They have room for some extra gear or a carrier, and allow sufficient space for your pet to stand up and stretch its legs. Larger dogs tend to mean bigger vehicles, especially if they’re part of a larger family. SUVs are a good choice, and come in a variety of sizes to meet your needs. 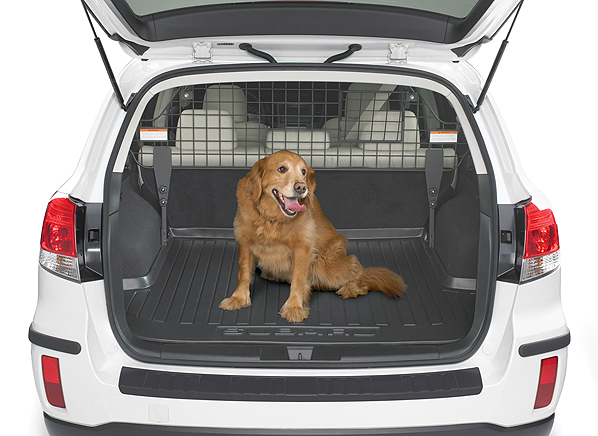 Minivans provide the most room, and have a lower load floor than most SUVs that makes it easier for the pets to get in and out—especially as they get older. Whatever size you choose, keep in mind that vehicles with tie downs in the cargo area make it easy to safely secure a crate. Many wagons, SUVs, and minivans have this feature. Chances are, you’ll want to keep the pets off the seats or cover them, but it’s still a good idea to avoid cloth seats. 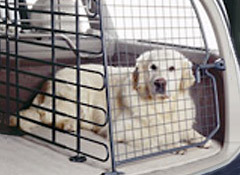 Some carmakers like Subaru and Volvo offer optional plastic liners and pet barriers for the cargo area, and plenty of others are available through pet stores or on the internet. If you don’t want or aren’t in the position to take on the added expense of a new car, there are lots of companies that make products to make traveling with pets safer and easier. Keep in mind that none of these products have been tested in our labs. All can be found in pet stores or big box outlets, or online from suppliers like Drsfostersmith.com, Barkbuckleup.com, Frontgate.com, Ohmydogsupply.com, or Solvitproducts.com. According to Barkbuckleup.com, a 60-lb dog traveling at 35 mph can turn into a 2,700 pound projectile in an accident. For the safety of your pet and your family, look for a harness that lets your pet sit or lie down, but will keep them restrained in an accident. Pet friendly guide book – For tips on lodging, pet stores, emergency services, and pet friendly parks along the way. Also check out websites like petfriendly.com and petswelcome.com. Collar ID Tag – Get one with your pet’s name, your name, and your telephone number. A cell number is best for the road, or you can tape a local number to the collar. Bring along your own vet’s number, too. Permanent microchips for tracking are also available. Ask your vet. Pre-packaged food – Bring along your pet’s usual food, and prepack each meal in a Ziplock bag. Familiar food is good for your pet on the road, and can save money over buying as you go. Packing by serving is less messy and more convenient. If you have more than one pet, label each one’s food separately, and always bring spares in case you get stuck. Biscuits, treats, toys – A favorite toy or two relieves stress. Water in resealable plastic container – Any plastic bowl will do, but a number of sources offer specialty travel bowls. Dog towels – if your dogs like to swim, bring along some old towels. They’re also handy if the pooch takes an unexpected mud bath. Your friends and hotel staffs will thank you. Leash, and maybe a longer run – It should be obvious, but don’t forget the leash. A longer run is good if you’re going to be tying the dog outside. Documentation of shots – Don’t leave home without them. Medications – Don’t forget any pills, ointments, or anything else you give your pet at home. Plastic bags – For cleaning up after your pet. Litter and box – If you’re traveling with a cat. Pet carrier – For cats and smaller dogs. Cleaning supplies – in case there’s an upset stomach or “accident” on the road. As much fun as it can be for both the pet and the family to bring Fido or Snowball along on a trip, traveling with animals generally requires a bit more planning. If you’re staying in hotels, make sure they’re pet friendly before you book. And keep in mind that some hotels and motels that say they allow animals may have weight limits. If you have a 200-pound Mastiff, make sure you let your hosts know ahead of time. Stop every couple of hours to let your pet take a break and have some water. Don’t leave a pet in the car unattended in the car without leaving windows a few inches open. Open the sunroof if you have one. And never, ever leave a pet in the car on hot days. Some carmakers including Subaru and Volvo cater to animal lovers with special equipment packages. These save you the trouble of locating components separately, can be included in your financing, and are covered by the manufacturer warranty. Dr. Ernie Ward is veterinarian, lecturer, and author based in Calabash, N.C. Dr. Ward gave us some of his own tips for traveling with pets. Tea or powder mixed with dry food is good for dogs or cats. A similar product for cats. Helps many stressed pets. Small dogs and cats should receive 12.5-mg every 4 to 8 hours and larger dogs should be started at 25-mg.